Sharing a room with a sibling can be trying at times. However this can be an opportunity to make and grow a friendship that will last a lifetime. ‘A sister is a forever friend’ wall words are a wonderful way to help your little girls appreciate each other. 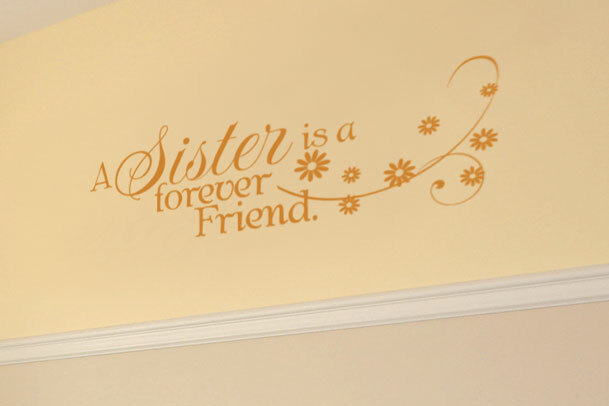 These wall quotes were applied on the wall above the bed in a room shared by two sisters. The swirls and lettering art made them even more lovely to look at. They created a joyous mood. They tie in well with the rest of the decor in the room. 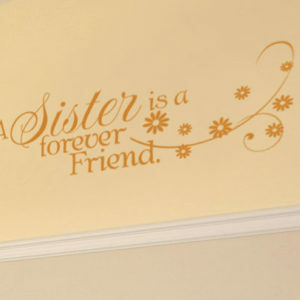 The girls will love sharing this room: the wall letters will help form a bond that will get stronger with time. Do you want to help your girls enjoy their God ordained relationship? Do you want to decorate their bedroom with wall decor that will help them enjoy being siblings? Try wall words from WiseDecor. They are easy to apply and durable. They are also stylish and are a wonderful alternative to paint. You will end up with wall decals that look as though they were painted but without the back breaking work. It takes only a few minutes to put them up but you will enjoy them for a long time. They can be removed just as easily should you wish to reapply them onto a different spot. Do call or email: we would love to help your girls enjoy being siblings!